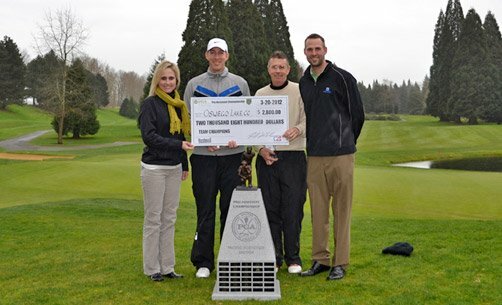 The Pacific Northwest Pro-Assistant Championship took place at Columbia Edgewater CC. Round 1 was held on Monday with a 1:00 PM shotgun start. The PNW PGA Spring Meeting was held after the conclusion of the first round at 7:00 PM. The final round started on Tuesday with an 8:30 AM shotgun start. The Oswego Lake CC team of PGA Professionals Brent Murray and Scott Erdmann came from two shots back to post 9 under par 133 thanks to a final round 64 that included 7 birdies and an eagle to overtake first round leaders of Rob Gibbons and Bruce Stewart from Arrowhead GC. Four teams were tied at two shots back 135. Dan Hill and Tim Feenstra of Broadmoor GC posted 8 birdies on their way to a 64 as well. For the victory, Murray and Erdmann earn $2,800 out of the $22,100 purse. Our thanks to Sally Schmitz of Bushnell and Bryan Dickson of Cutter & Buck for their support. A special thanks to host professional Bryan Tunstill and his staff and especially to superintendent Gordon Kiyokawa and his crew for a fantastic golf course. The weather held off and we enjoyed a great track. The history of the Pacific Northwest Professional-Assistants Championship has been timeless. It all started in 1992, when the event got off to an exciting start. It took the Progress Downs team of Jerry Minor and Ralph West SEVEN holes of sudden-death to finally shake the Royal Oaks duo of Steve Bowen and Michael Wilkerson. After shooting 14-under at Tacoma Country and Golf Club, neither of the two teams could get a birdie putt to drop in the playoff. The 1995RedwoodGolfCenterteam of Scott Williams and Mike Barnett still holds the tournament record after scorching the rest of the field with an 18-under 126 at McCormick Woods GC and winning by three strokes. This championship has fostered camaraderie between the Head Professional and his Assistant and is one of the most popular events of the Pacific Northwest Section PGA. In 2008, Head PGA Professional Steve Prugh and his Assistant Corey Prugh made history by being the first father-son duo to capture the title which they won again last year. The Pro-Assistants Championship is a two-man team competition with one head golf professional and their assistant golf professional playing a four-ball competition. CLICK HERE to view past team champions of this event.